I read an article titled “L. 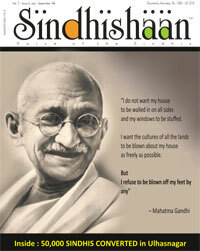 K. Advani – Bouquets and Brickbats” in SindhiShaan issue No. 2 of April-June 2008. The writer has showered flowers of praise on Mr. L. K. Advani and he is holding him in high esteem. “Very Good” But he found him politically guilty of creating division in the country between religions due to his Rath Yatra which has caused polarization, contrary to the secular credentials of India (Page – 44). It is a historical fact and perhaps folly that Mr. M. K. Gandhi was the first leader who created communal polarization by supporting the cause of Khilafat Movement, which pushed the Indian Muslims into the Pan Islamic camp. Thereafter in the post-Independence period, Jawaharlal Nehru was the tool in creating communal polarization in the country to create a vote bank of Muslims which is being followed sacredly by his party even today. Only these politicians, not statesmen, subscribe to this mentality. With the result the Muslims of the country were not allowed to fall into the mainstream of our nation even after the division of the country. In this process the first casualty was secular credentials. At this junction where was Mr. L. K. Advani & his party? Moreover he (writer) has accused him that due to Rath Yatra religious intolerance took place and caused a great divide in the country. Sardar Vallabh Bhai Patel, the first Home Minister of Independent India, renovated & converted Somnath Temple into a magnificent edifice after demolishing few mosques in the vicinity of Somanth mandir despite the opposition from Jawaharlal Nehru. Was it an action causing division in the country? It was a commendable action to restore the pride of the country which was smashed with several attacks by the Muslim invader Mohmad Gaznavi. Orthodox religious (branch of Christianity) Russia demolished the Church which was built in Moscow by their victorious enemy, as soon as they got an opportunity to do so. This happened also in Rome (Italy). Therefore the Rath yatra is not the cause of dividing the country. Moreover Congress has ruled the country for more than 40 years which has divided the communities particularly the polarization of Muslim's votes. What was the cause of driving all Non Muslims from the Kashmir valley right from 1980, when there was neither Rath yatra nor L. K. Advani to influence any political vendetta. All these events are the chain re-actions of the polarization of the Muslim community. This concept was created by M. K. Gandhi and is being sacredly followed by the Congress political progeny. This is a fact! On the contrary when there was the government of BJP in 1998-2004 not only the harmony of two communities was at its peak but nowhere did any communal riot take place, except in Gujarat, which was in re-action to the Godhra train incident. Macaulay & Nehru's ideological elements moulded press and persons who raised hue and cry when Hindus retaliated and reacted. Unfortunately we all call it religious intolerance and divide the country. Now the Jammu & Kashmir government, being ruled by Congress, withdrew the granting of piece of land i.e. 40 hectares to the Amarnath Shrine Board due to the pressure from Muslims of Kashmir. Don't we feel that this is an abject surrender to Islamic separatists? Obviously the secularists will raise their voice and condemn it as religious intolerance, it will divide the country. Now what should the people of Jammu do in this Land Row for ASB. This land which is to be used for few months for the pilgrims of Amarnath Yatra in order to provide temporary shelter and proper sojourn facilities. It is not the grabbing of land of any other country or so. This kind of treatment together with several other instances meted out to Hindus alone, has naturally caused irritation and they feel that they have the status of a Second class citizen in their own country. Last but not the least, the instance of communal harmony, I will quote, during the BJP & Shiv Sena Government in Maharashtra for 4 ½ years, was commendable. Nowhere did a single communal riot take place in the state. Moreover, today Gujarat is the topmost state with all round development. The communal harmony is effectively working even after witnessing the holocaust of communal riots. Therefore the charges against L. K. Advani are based on general maliciousness and prejudices created by the English Electronic & Print Media supported by the so called secular forces.